Please call Damian at 707-845-6799 if you are interested in ordering a custom ambigram. A custom ambigram is an especially unique gift that lasts forever! Click Here to see our Gallery for Ideas! Sorry, for some reason, I cannot get a single good picture of a tattoo I designed :( There about 15 of our tattoo designs out in the world, as we have a chance we'll get more and better pictures up. Call us if you want a custom ambigram. We can make something serious, funny, whatever! Just give us a call! 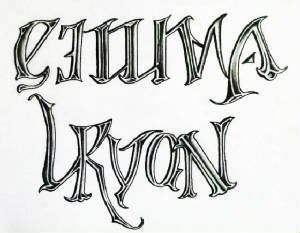 This is an example of a recent custom ambigram I made for a friend. "Noah James" is his son, and "Emma Ryan" is his daughter.